Our new Strike Fx 2kg FM200 Automatic Extinguishers are the newest products to join our automatic extinguisher range. With the same fire fighting capabilities of a standard automatic extinguisher the Strike Fx FM200 fights the fire with the aid of a specialist polymer detection tube. Using a clean and safe gas to put out a fire quickly and easy to fit not requiring any electrical or moving parts. 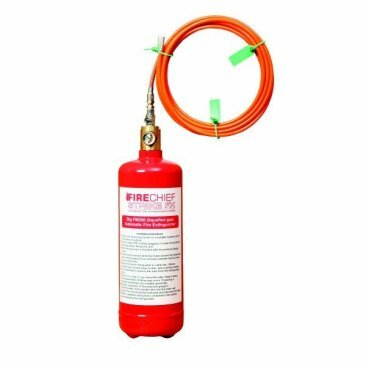 Giving coverage in all those hard to reach areas in an server cabinet or engine bay where you cannot get an extinguisher in close, the polymer tubing can be placed in a a smaller area and the tubing being a huge 4m long it should cover most areas. When a fire is detected only this part of the tubing reacts allowing direct discharge to the source of the fire.